•All lots are sold as genuine, unless noted. In the event of a discrepancy, we must be notified within five days of receipt. •An item with faults which is described as such, cannot be returned for any fault condition. •No illustrated lots may be returned because of centering, margins, perforations or other factors shown in the illustrations. •Lots accompanied by an Expert Certificate shall not be subject to re-certification. •Those who wish to submit a lot for expertization must notify us in advance or within five days of receipt and the lot must be paid for. •If a mutually acceptable expert finds a lot to be misdescribed, we will refund the full purchase price, plus the expert fee up to a maximum of $100. •No lot or lots may be returned if altered. •For all expertization Main Street Philatelics, Inc. will submit all lots to the appropriate authority. •Missouri residents will be subject to state sales tax, unless exempt and provide a valid resale certificate. •Insurance and postage will be added to the invoice. 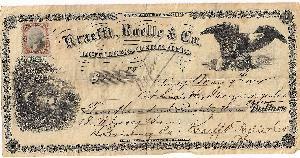 1872 Distillers & Rectifiers Bank Draft with Revenue franking. Nice illustrations. 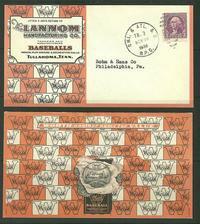 1945 Naval Academy football schedule on cover with meter franking. Huntington, CT sent to Milton & forwarded to Bridgewater. Includes all cancels & m.s. 'Forwarded 3' & 'PAID' cancel. Bit ragged @ top & no back flap. 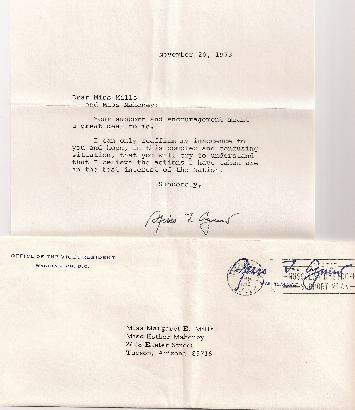 Spiro Agnew free frank cover with letter claiming his innocence in a signed letter. Interesting piece of political history. Sc. WS-7 tied by 1971 cancel to Washington with 'Due' marking & meter postage paid. Unusual oddity!!! January 10, 1930 Cedar City, Utah 'Interrupted Flight Cover' with auxiliary markings.